The automotive wiper is a device that is used to remove snow, rain, and dirt from the windshield of the vehicle in order to maintain clear vision while driving. Demand for wipers is high, as front wipers are mandatory in vehicles. The global automotive wiper market has been segmented based on wiper blade, vehicle type, sales channel, and region. In terms of wiper blade, the automotive wiper market has been classified into standard blade, beam blade, and hybrid blade. The beam blade segment is estimated to hold a major share of the global automotive wiper market by the end of the forecast period. Rising consumer affordability and demand for newer efficient technology is propelling the demand for beam blade wipers. Based on vehicle type, the automotive wiper market has been segregated into passenger vehicle, light commercial vehicle, and heavy commercial vehicle. The passenger vehicle segment held a prominent share of the market in 2017, owing to the high production volume and higher rate of utilization of rear wipers in passenger vehicles. The light commercial vehicle segment is expected to expand at a high growth rate in the market in North America and Latin America due to high consumer preference for these vehicles in these regions. Based on region, the automotive wiper market has been segmented into North America, Europe, Asia Pacific, Latin America, and Middle East & Africa. Asia Pacific led the global automotive wiper market due to high volume production of vehicles in China, India, and Japan. Expansion of economies of China, India, and countries in ASEAN is expected to further boost vehicle production and registration of on road vehicles in Asia Pacific. Consequently, the region is projected to dominate the global market during the forecast period. 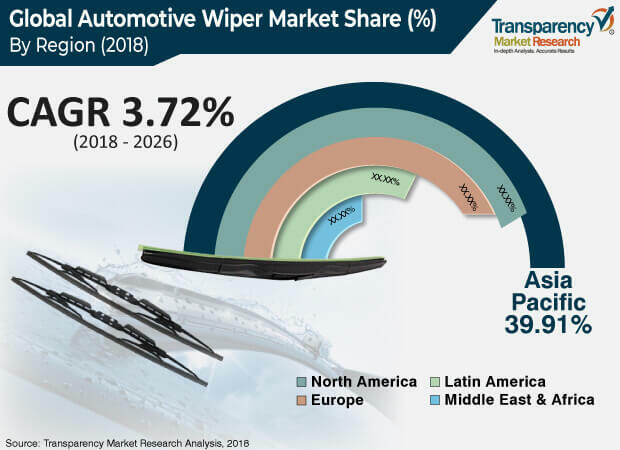 Key players operating in the global automotive wiper market are Valeo, TRICO, Robert Bosch GmbH, Mitsuba Corp., AM Equipment, B.Hepworth and Company Limited, DENSO Corporation, DOGA S.A., Federal Mogul Motorparts LLC, HELLA GmbH & Co. KGaA, Magneti Marelli S.p.A., Nippon Wiper Blade Co., Ltd., Pilot Automotive, Robert Bosch GmbH, and TEX Automotive Ltd. This report analyzes and forecasts the wiper market at the global and regional level. The market has been forecasted, based on value (US$ Mn) and volume (million units) from 2018 to 2026. The study involves the effect of all the factors that can contract or expand the market globally as well as regionally. The report also highlights opportunities in the automotive wiper market at the global and regional level. The report contains value chain analysis, which provides a comprehensive view of the global automotive wiper market. The Porter’s Five Forces analysis for the market has also been included to help understand the competitive landscape in the market. The study encompasses market attractiveness analysis, wherein end-users are benchmarked based on their market size, growth rate, and general attractiveness. The study provides a decisive view of the market by segmenting the market in terms of wiper blade, vehicle type, sales channel, and region. These segments have been analyzed, based on present and future trends. Regional segmentation comprises current scenario along with forecast of the automotive wiper market. The forecast provided is based on the compilation of current trends as well as expected scenario in the future, due to change in technological, geographical, political, and economic factors. The study includes profiles of major companies operating in the automotive wiper market. The global market is dominated by major automotive wiper manufacturers such as AM Equipment, B.Hepworth and Company Limited, DENSO Corporation, DOGA S.A., Federal Mogul Motorparts LLC, HELLA GmbH & Co. KGaA, Magneti Marelli S.p.A., Mitsuba Corp., Nippon Wiper Blade Co., Ltd., Pilot Automotive, Robert Bosch GmbH, TEX Automotive Ltd., TRICO, and Valeo. Market players have been profiled in terms of attributes such as company overview, financial overview, business strategies, and recent developments. The automotive wiper market is primarily driven by rising sales of SUVs, cross-overs, and hatchbacks and their increased utilization of rear wipers and increasing production of vehicles. The report provides the estimated market size of automotive wiper market in 2017 and forecast for the next nine years. The global market size has been provided in terms of value (US$ Mn) and volume (million units). Market figures have been estimated, based on wiper blade, vehicle type, sales channel, and regional segments of the automotive wiper market. Market size and forecast for each major segment have been provided in terms of global and regional/country markets.